Our physiotherapists and wellness practitioners are here to help you experience your very best state of physical health and wellbeing. It’s our mission to help you move the way you want to move, to do the physical activity that you love to do – life is too short to be missing out. Physiotherapy Plus for everybody – your next move to a healthy and happy lifestyle! We provide comprehensive physiotherapy services for enhancing your physical movement and overall quality of life. Remedial massage uses a hands on approach to treatment which includes a variety of advanced massage techniques, stretching and exercise to assess and treat soft tissue dysfunction. 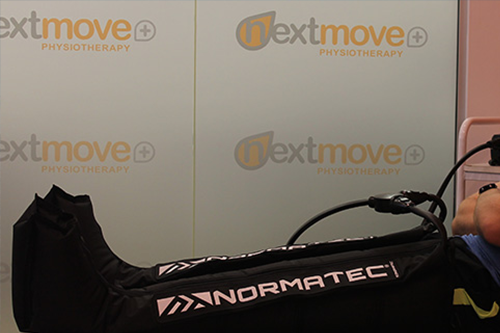 The NormaTec Pulse Massage Pattern starts in the foot, hand, or lower hip and moves upwards zone-by-zone massaging the limb and mobilizing fluid out of the extremities, helping your muscles grow and recover from damage. At NextMove we are encouraging kids and young people to get active at a young age, make healthy life choices and establish healthy routines for life. We run specific Youth Gym sessions for kids and teenagers at our Hillary's clinic. At NextMove we understand most runners want to run injured or not! This is why we can design a comprehensive exercise program that will help make you a more efficient runner and keep you out there ‘pounding the pavement’. Our Wellness Menu is here to optimise your movement, treat injury and illness, facilitate weight loss, rehabilitate and offer preventative programs to build your body’s strength and resilience. The true value of Bike Fit Assessments at NextMove are wide, compressive and varied. We provide comfortable physical and functional advice that will result in positive changes to your life when cycling. Our hydrotherapy rehabilitation programs are overseen by experienced physiotherapists, offering a wide range of benefits to all. Exercising in water helps reduce the pressure and stress on your body and joints.